Highlights of this Central Europe tour include visits to some of the region’s most significant churches and cathedrals. Visit the pilgrimage church in Wies, a Rococo masterpiece and UNESCO World Heritage Site dating to the 1740s set in a gorgeous alpine setting. In Trier, another UNESCO World Heritage Site and one of the oldest cities north of the Alps, visit the High Cathedral of St. Peter. This UNESCO World Heritage Site dating to the 4th century is Germany’s oldest bishop’s church. In Aachen, visit Northern Europe’s oldest cathedral, dating to 803 AD. This UNESCO World Heritage Site is the burial place of Charlemagne, the church used for the coronation of German kings and queens, and still a pilgrimage church. Visit the Benedictine Abbey of Einsiedeln, one of Switzerland’s most important pilgrimage sites and renowned for its black Madonna carved in the 15th century. You’ll also witness stunning scenery on this Central Europe tour. 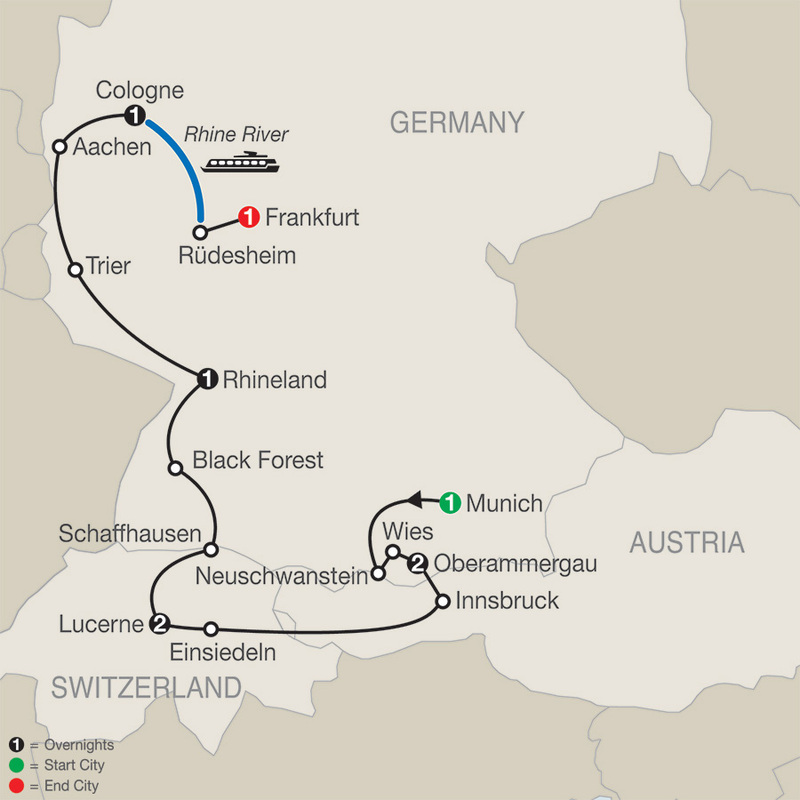 Marvel at Rhine Falls, Europe’s biggest falls, and enjoy a cruise along the most scenic part of the Rhine River. Stop in the Black Forest with beautiful forests of thick pine trees. This is just a sampling of the many highlights of this Catholic Central Europe with Oberammergau tour. It’s a dream vacation! Motorcoach, boat cruise. Free wi-fi available on your motorcoach and in most hotel lobbies. Welcome to Munich! At 6 pm, meet your Tour Director and traveling companions, then enjoy this evening’s welcome dinner at your hotel. Your orientation of Germany’s “Secret Capital” includes the Olympic Stadium, 1,000-foot-high Television Tower, MARIENPLATZ with its old and new Town Halls, and the gothic FRAUENKIRCHE. Enjoy a scenic drive to Neuschwanstein for an exciting visit to magnificent KING LUDWIG’S CASTLE, which was the inspiration for Walt Disney’s Sleeping Beauty castle. Before arriving in Oberammergau, stop for a visit to the beautifully-located pilgrimage CHURCH of Wies, a Rococo masterpiece. Today is dedicated to the PASSION PLAY, held every 10 years and performed by the inhabitants of Oberammergau. A picturesque drive through the Bavarian and Tyrolean Alps brings you to Innsbruck. Enjoy a pleasant walk through its quaint medieval lanes and take pictures of the GOLDEN ROOF. Cross the border and enter Switzerland, where you will visit the impressive Benedictine ABBEY OF OUR LADY of Einsiedeln, renowned for the famous black Madonna and its unique baroque architecture, on your way to picture-book Lucerne. On your walking tour, admire Thorwaldsen’s LION’S MONUMENT, dedicated to the Swiss Guards who protected the Royal House of France during the French Revolution, and the ornate patrician houses of the walled town. Then, cross the famous covered CHAPEL BRIDGE and visit the JESUIT CHURCH with its onion-topped towers, built by the Jesuits in the time Protestantism came up and the reason that Lucerne remained Catholic. Also included is a visit to the Hofkirche ST. LEODEGAR, the most important church and a landmark of the city. Afternoon and evening at leisure; you may wish to join exciting optional excursions to Mount Pilatus and attend a Swiss Folklore show. A short drive to Schaffhausen to admire the famous RHINE FALLS; then, enter Germany, and stop in the Black Forest to enjoy a WOODCARVING DEMONSTRATION, before continuing to the Rhineland for your overnight stay. This morning is dedicated to Trier, one of the oldest cities north of the Alps. During your orientation, admire the Porta Nigra, a large Roman city gate, visit the HIGH CATHEDRAL OF ST. PETER, and see the unusual early-gothic Dreikönigenhaus. Then, continue to Aachen for a visit to the oldest CATHEDRAL in Northern Europe, burial place of Charlemagne, and for 600 years the church of coronation for German kings and queens. Arrive in Cologne for your overnight stay. The morning is dedicated to a visit of the magnificent CATHEDRAL, sometimes called the most beautiful example of gothic art. Next is a romantic RHINE CRUISE along the most scenic part of the Rhine River, followed by a special treat: a WINE TASTING in the capital of Riesling wine, Rüdesheim. This evening, a farewell dinner has been prepared at your hotel.